[miau] Lunaris is one of the most unique slots games that online gamblers will run across. This can serve as a big benefit in itself, since this creative layout is certainly more than enough to keep most entertained while they gamble. The overall structure of the game gives players two separate sets of reels, one of which is a 5-reel video slot with 25 paylines, and the other offers a larger, more vivid 5-reel, 75-payline spread. Not only is this entertaining to look at and play, but it also increases a player’s odds of actually winning on a line-by-line basis. The play is fast and entertaining, and the video graphics are well above average. 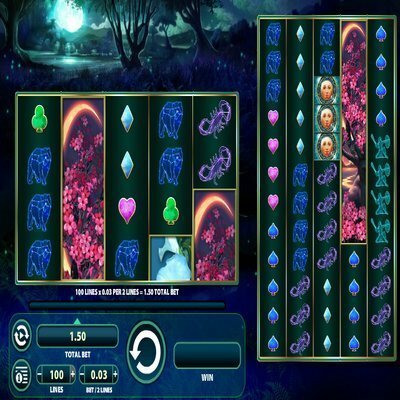 Lunaris is a popular online slots game, and anyone playing can understand why. The unique setup of this slots game makes it a real feast for online slots player, and it’s no mystery why Lunaris is such a feature-rich game. 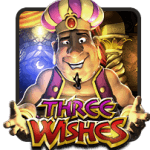 It was developed and released by WMS, which has long been a top-notch provider of online casino games. It’s a fun game that also offers some big money. WMS put Lunaris in their line of games that offer a large potential for winning and also a relatively high payout percentage. As far as the symbols of Lunaris go, there’s nothing too creative here. You have the standard playing card symbols, and then a Statue, a Scorpion, Telescope and Flower symbols. It really begins to get exciting once you encounter the scatter and wild (bonus) symbols, which are the Caterpillar and Butterfly symbols respectively. There is also a wild symbol, a Face, which gives you increased opportunities to stack up jackpot symbols on multiple reels. And since you’re playing with adjacent dual reels, you have double the odds of hitting a jackpot and receiving bonus spins or big payouts. The betting structure of Lunaris might seem a bit complicated for beginners. For instance, since there are two separate reels to deal with, with 100 paylines in total, you might get a little confused when attempting to bet line-by-line. However, it doesn’t take very long to figure out that a player can bet on all 100 lines if they so choose, or they can mix and match which lines to bet on. The coin size in total varies from 0.01 to 5.00 per two lines, so you can really build up a large bet. However, don’t expect payouts that are overly large. This isn’t a progressive machine. Where Lunaris scores big points is in the unique construction of the reels themselves. Having two separate sets of reels really adds to the excitement of playing. While you might not score big on one, there’s always a chance of hitting some mystery symbols (the Face) on another and ultimately landing free spins or a bonus game. That aside, there’s nothing overly fancy or spectacular about Lunaris. It’s a basic online slot machine that operates in a no frills fashion. There aren’t any video-specific entertainment breaks, and you’re not going to hit a Vegas-style jackpot while playing. The win percentage is rather high, but the award amounts are not.